This is a book about managing hot dog vendors in New Orleans' French Quarter. 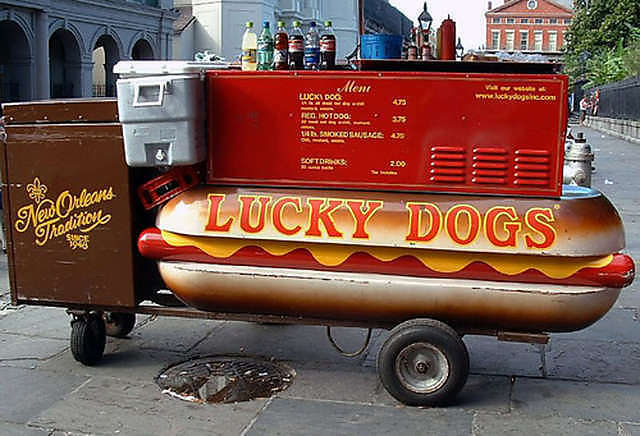 Strahan worked for "Lucky Dogs, Inc." for over twenty years, and most of his vendors were real characters. Being a big fan of John Kennedy Toole's A Confederacy of Dunces, I had to read this book. In Kennedy Toole's novel, Ignatius Riley takes a job selling weenies at Paradise Vendors. He even writes a hilarious journal about it, "Diary of a Working Boy." I wasn't surprised to learn that Paradise Vendors was based on Lucky Dogs, nor that the real life weenie pushers were nearly as eccentric as Ignatius himself. Strahan was once a PhD candidate in History at Tulane, but he gave it up to manage Lucky Dogs. The book is basically a series of anecdotes, proceeding chronologically from the early seventies to the mid-nineties. - The vendors themselves are characters, but they are surrounded by a varied assortment of pimps, strippers, street walkers, transvestites, petty thieves, cops and winos, all of whom share the streets of the Vieux Carré. While all of the characters might be characterized as "memorable," there are so many of them over the course of the years that it is hard to remember their names or keep track of them. So you just read on. A couple of pitches: "Don't be a meanie, buy a weenie!" and "Eight inches of fun on a bun." "The smarmy hordes of East Coast skeptics are scourged, smitten and righteously driven in disarray form their suffocating Temple of Doubt into an eternal diaspora where their cynicism and heresy will justly prosper among the weeds, as Ignatius might have put it. I am grateful to you for the shirt and the photograph. My reputation (rather mediocre) is restored, thanks to you. Although I recognize I could never replace Ignatius, I take your job offer seriously. I should be able to sell a hot dog or two after all the baloney I've been pushing at the State Department." Nearly all the vendors are short-term. And they don't announce their resignation, they just don't show up for work one day; or worse, abandon their carts in the street and escape on a Greyhound with the day's take. All in all, an enjoyable read. But if you haven't first read A Confederacy of Dunces, you must read that masterpiece first.